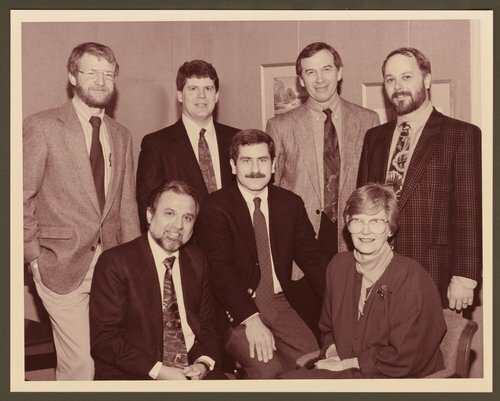 This photograph shows Stephen Lyrene, MD; Bud Dale, PhD; Flynn O'Malley, PhD; and Kirby Pope, MD in the back row. Manuel Morales, MD; Lee Ascherman, MD and JoAnn Myers, PhD are in the front row. In 1926, the Menninger Clinic established the Southard School for children. The school fostered treatment programs for the mental health of children and adolescents that were recognized worldwide. The new buildings of 1968 and even more importantly these staff members, continued that tradition.